RNA processing, including alternative regulations of transcription initiation, splicing, and 3’ end formation of pre – mRNA, is a highly specialized mechanism that enables to generate multiple isoforms from a single gene. This mechanism expands transcriptome and proteome diversity from a limited number of genes. In human cells, ~100,000 different proteins are estimated to be translated from 20,000 protein-coding genes. In addition, alternative splicing provokes mRNA downregulation by nonsense-mediated decay through introduction of a premature termination codon. Similarly, alternative transcription initiation and alternative 3’ end formation increase variability in mRNA 5’ and 3’ untranslated regions (UTRs), respectively, which affects cis-acting elements that control mRNA stability, translation efficiency and localization. More than 90% of transcripts undergo alternative RNA processing, which often occurs in a tissue-specific manner and/or under specific cellular conditions. Alternative RNA processing is particularly essential in the nervous system, and its dysfunction is frequently observed in neurological disorders in humans. Fig. 1. A proposed model for FUS-dependent regulation of mRNA length. 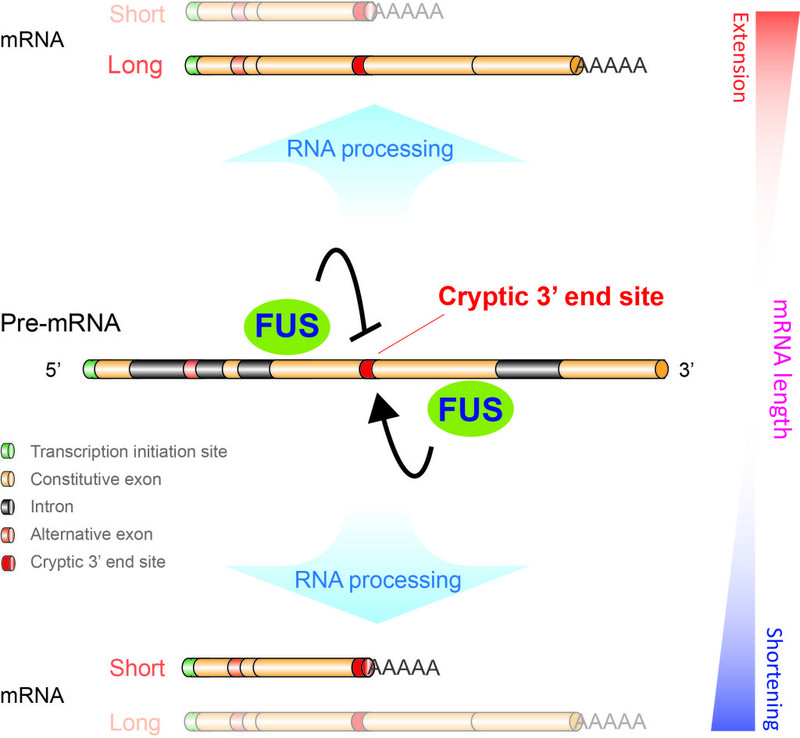 FUS is recruited to pre-mRNA immediately after its transcription, and regulates RNA processing, such as transcription initiation, splicing, and 3’ end formation. When FUS binds upstream of the alternative 3’ end site of pre-mRNA, FUS suppresses subsequent 3’ end formation to downregulate a short transcript. In contrast, when FUS-binding site is downstream of the alternative 3’ end site, FUS recruits CPSF160 to the target transcript and facilitate 3’ end formation to upregulate a short transcript. Through such regulation of 3’ end formation, FUS globally controls mRNA length and develops transcriptome diversity. Fused in sarcoma (FUS) is a multifunctional RNA-binding protein that is associated with oncogenesis and neurodegeneration. FUS was originally discovered as the N-terminal part of a fusion protein with the transcription factor CHOP in human myxoid liposarcoma. Recently, the role of FUS in neurodegeneration has been extensively studied, because mutations in FUS are associated with amyotrophic lateral sclerosis (ALS), characterized by loss of motor neurons in the spinal cord and motor cortex. Furthermore, the FUS protein has been identified as a major component of intracellular inclusions in neurodegenerative disorders including ALS and frontotemporal lobar degeneration (FTLD), which is the second most common early-onset dementia and shares some clinical and pathological features with ALS. FUS has multiple functions in RNA metabolism, including transcriptional regulation, RNA processing, formation of stress granules, and RNA transport. FUS interacts with various components of the transcription machinery, spliceosome, and the 3′ end processing machinery. Transcriptional regulation by FUS is achieved by direct binding of FUS to C-terminal domain of RNA polymerase (RNAP) II and the general transcription factor, TFIID. FUS also interacts with splicing and 3’ end processing factors, such as SR proteins, SMN complexes, CPSF160 and U1 snRNP. Recent advances in high-throughput transcriptomic profiling approaches have enabled us to determine the global mechanisms of RNA regulatory networks in RNA processing at a cellular level. RNA-seq is a powerful tool for the study of alternative splicing and isoform expression. Cap analysis gene expression (CAGE)-seq and PolyA-seq are specialized in identifying and quantifying the 5′ ends and 3’ ends of transcripts, respectively. Cross-linking immunoprecipitation coupled with high-throughput sequencing (CLIP-seq) is a global survey of interactions between an RNA-binding protein and RNA. RNAP II ChIP-seq is widely used for the analysis of RNAP II-dependent transcription status. We conducted comprehensive analysis of RNA-seq, CAGE-seq, PolyA-seq, CLIP-seq, and ChIP-seq in Fus-depleted neuronal cells, and demonstrated that FUS-RNA interaction determines mRNA length and regulates isoform expression mainly through the regulation of 3’ end formation. When FUS binds downstream of the alternative 3’ end site of pre-mRNA, FUS recruits CPSF160 to the target transcript and facilitate 3’ end formation to upregulate a short transcript. In contrast, when FUS binds upstream of the alternative 3’ end site, FUS suppresses subsequent 3’ end formation to downregulate a short transcript. Position-specific regulation of mRNA lengths by FUS is operational in two-thirds of transcripts in neuronal cells, with enrichment in genes involved in neuronal functions and development, especially in synaptic activities. FUS-dependent regulation of mRNA length is a uniquely fine-tuned system to, dysregulation of which leads to neurodegeneration. Masuda A, Takeda J, Okuno T, Okamoto T, Ohkawara B, Ito M, Ishigaki S, Sobue G, Ohno K.